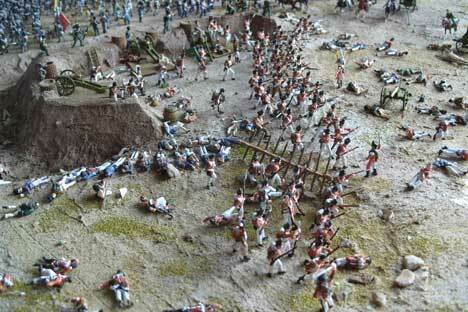 Military enthusiast Gerry West has made a diorama of the Borodino battle. Source: Press Photo. The Battle of Borodino has been brought to life in London. From Sept. 4 to 14, 2012, Rossotrudnichestvo’s Kensington office is housing a special Borodino exhibition as part of the bicentenary celebrations of the famous battle. The display includes original diplomatic correspondence from 1812, but the main showpiece is an intricate scale model of the action at the center of the battlefield. The exhibition was officially opened by Russian Ambassador to the UK Alexander Yakovenko at an evening reception on Sept. 6. Special guests at the event were Nina Barclay du Tolly, direct descendent of one of the battle’s main heroes, General Michael Barclay du Tolly, and also the model-maker himself, Gerry West. Over the past 40 years, West, a retired engineer from Shropshire, has spent his spare time recreating the battle in miniature. West says his interest in Borodino started with a book he read as a child called “The Dog that went to Moscow,” a fictional account of the Napoleonic wars. Later, he was inspired by the Russian film adaptation of War and Peace, along with a book by Christopher Duffy about Borodino. He first announced his intention to build a scale model in 1973 and since then has been researching and constructing it whenever time allowed. Asked what his wife thinks of all the hundreds of hours he spent tinkering in his shed, West replied that, for her, “it’s a preferable alternative to golf.” As his project neared completion, West had the idea of contacting the Russian Embassy, which responded quickly and enthusiastically. The most difficult part of the whole endeavor was apparently transporting the finished model to its current location in London. Russian Ambassador to the United Kingdom Alexander Yakovenko at the exhibition openning. Source: Press Photo. The diorama West created represents about one-fifteenth of the whole battlefield and depicts a certain moment in time (about 8:30am on Sept. 7, 1812). The regiments and the terrain have been meticulously researched; West even made a trip to the actual battle site earlier this year. The model comprises over 2,000 individual figures. Each is around 25mm tall and took 4-5 hours to make. No two figures are the same, and details such as water bottles, oat-bags for the horses, and the soldiers’ realistic body positions create an overall effect of life and movement. A close look reveals various incidents taking place. For example, at the center of the piece, Napoleon’s brother-in-law, Field Marshall Joachim Murat (complete with characteristically flamboyant clothes and ostentatious white horse), narrowly escapes capture by the Russian 2nd Cuirassier Heavy Cavalry Division. There have been many different accounts of Borodino, and historians disagree as to what actually happened on the ground. In general terms, a popular theory (and one put forward by Alexander Pushkin in his 1835 poem “The Commander”) is that General Michael Barclay du Tolly secured Russia’s moral victory with his decision to withdraw troops. The retreat allowed Russian forces to regroup and gather their strength, and forced Napoleon’s army to advance further into Russia, ever farther removed from their supply lines. By the time Napoleon reached Moscow, his army was in no position to cope with the encroaching Russian winter, and Napoleon was forced to make an inglorious retreat back to Paris. Nina Barclay du Tolly described what her ancestor (who was originally from Scotland) went through as he defended Russia from invasion. She said that as the battle of Borodino raged, he lost three horses from underneath him and saw his personal aides drop like flies, but his courage returned and he was able to make a decision that sealed the fate of Europe. In 1814, when General Barclay du Tolly came to England, the Duke of Wellington presented him with a ceremonial sword to thank him for his part in the battle. Two hundred years later, this amazing relic is in the possession of Nina Barclay du Tolly’s son. Gerry West and Nina Barclay du Tolly were both presented with special edition Borodino stamps developed by the Russian Embassy in conjunction with the Royal Mail. In his speech to mark the opening of the exhibition, Ambassador Yakovenko described Borodino as a “tactical win for the French Grande Armée, and a triumph of resilience and patriotism for the Russians.” Napoleon’s failed invasion of Russia represented the beginning of the end of his dominance over Europe, paving the way for an Anglo-Allied victory in the Battle of Waterloo in 1815.